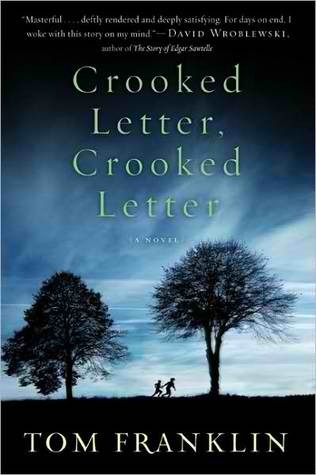 Crooked Letter, Crooked Letter is Tom Franklin's third novel and 2010 Edgar Award winner, also a current bestseller. Crooked Letter, Crooked Letter takes readers down to Chabot, Mississippi, where the southern tongue and lifestyle are accurately and charmingly portrayed. Larry Ott is an awkward, reclusive bookworm who is considered an outcast after a girl he dated mysteriously disappeared back in the 1980s when Larry was in high school. Now, years later, when another young girl goes missing, Larry is not only the subject of town gossip once again, but a prime suspect -- especially when he winds up in a coma after being shot at point-blank range. Suddenly authorities must question whether the injury is self-afflicted or if a genuine killer is on the loose. As if the plot weren't already crazy, add detective Silas "32" Jones into the mix, who has his own very intense history with Larry Ott. In addition to being best friends in the 1980s, the white-Larry and black-Silas have connections and secrets both have been clueless about all these years. Although Crooked Letter, Crooked Letter falls primarily into the mystery genre, its enjoyable, erudite beauty is bound to surprise and please fans of both the suspense and literature genres. The setting of Crooked Letter, Crooked Letter is absolutely splendid and convincing; with setting definitely being one of the more important make-or-break features of novels. Without taking the plot into consideration, readers will get a realistic and genuine glimpse of the Mississippi lifestyle when reading this novel. Readers will also be charmed by the relationship forged between young Larry and Silas, given that the Southern culture is still years behind the times regarding skin color's irrelevancy. The mystery itself unfolds slowly, but the murderer's identity is in plain view once we learn more about the character, so fans of guessing games and red herrings probably won't appreciate the lack of surprise. Nonetheless, the plot is well-crafted by far and I honestly don't care how easy the puzzle is to solve because the novel is truly a great story. Franklin's previous novels include Hell at the Breech (2003) and Smonk (2006).